These are some of MobileHorizon’s features. We are constantly adding more functionality and features to give you a decisive advantage over your competitors. A New Concept in App-Centric Client Reporting: Give your Client Reporting a new lease of life, with visually stunning and informative reports. Old fashioned Keyword Ranking Reports are useful in researching SEO campaigns and many SEO Professionals say their clients like to see them. MobileHorizons gives your Clients very useful new data points and feature live App Results Pages extracted from Smartphones and Tablets. 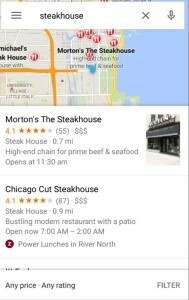 Send them beautiful new reports showing them where and how their businesses are showing up in mobile search apps such as Google Maps, Apple Maps and Yelp. Apps like these are where 89% of consumer search is happening. You can demonstrate to your clients how you’re “ahead of the curve” in managing their SEO Campaigns, with new reports that not just show a whole new slew of useful data, but the ARPs themselves look dazzling! Results Dashboards: You can use the Reports and online Results Dashboards to perform your own analysis and research. 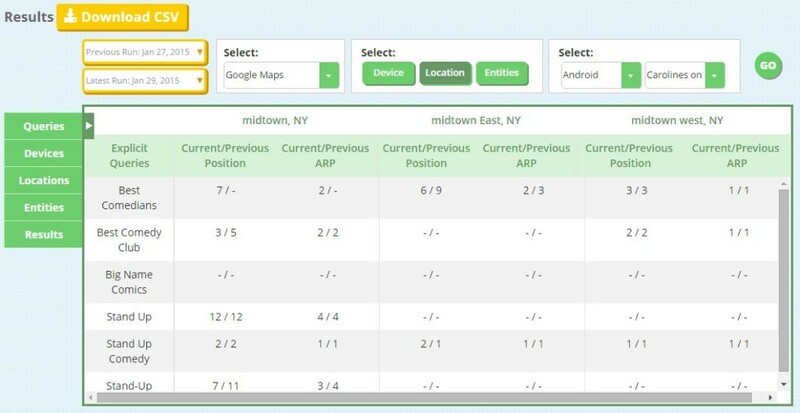 Track results using any combination of Entity, Explicit Search Query, App, Device and Location. Our Advanced Results Dashboards allow you to compare multiple dimensions at the same time right inside the app. No downloading necessary. And many new “vertical” apps, as well as native apps from all the main search engines!